A Year-Round Helicopter Trade Show. Extremely Affordable. No Need To Staff A Booth. No Entrance Fee. Worldwide Attendees. Is It Possible? (San Diego, California, USA): If you could advertise your company, year-round at a trade show, which was affordable, you didn't have to staff a booth and anyone (worldwide) could visit at any time... would do you this for your company? Yes? Well you can, when speaking virtually, with Helicopter Links website. Ask yourself, why do people attend trade shows? To see what companies are out there? To see the latest in technology? Then ask, why do companies have booths at trade shows? To advertise, brand and market their products and services, in order to gain new customers? Exhibitors: At a helicopter trade show, the big helicopter manufactures will announce the sales of helicopters (which might have taken months or years to complete the sale), they make spectacular unveilings for a new helicopter or a concept helicopter (a futuristic helicopter) and provide many freebies to passers-by. But helicopter manufacturers also focus on heavily branding their company by having their company name and logo displayed multiple times on huge display booths, having helicopters on display and information on the multiple services they provide to their customers. In addition, helicopter manufacturers will have invitation-only behind-the-scenes customer appreciation, by providing complimentary food and beverages (and possibly more exclusive and expensive freebies) inside their large office-like trade show booths. Helicopter trade shows are truly a grand show for these multi-billion dollar corporations. A large helicopter manufacturer can easily spend millions of dollars at one helicopter trade show, which typically last a mere 3 days! What About The Smaller Companies Exhibiting? These companies try to mimic the large corporations at a trade show but on a much smaller scale. The branding with multiple expensive freebies and expensive food, simply can't or won't be offered by these companies. We've all seen small booths at helicopter trade shows and their only freebie is a bowl filled with inexpensive candy! Some companies don't have the funds, don't have the know-how or simply forget to bring flyers or business cards for their display tables. My guess is that some smaller companies feel they must have a booth a helicopter trade show, even if it's extremely tight on their budget, to show they are a thriving business. Yet this big chunk of money is spent again, for usually a short 3 days! Attendees: For the attendees, helicopter trade shows are lots of fun. It's a great place to meet people from around the world, make friends, get many freebies, find out about new products and services, discover companies you've never heard about and interact with people from many companies. But what about the rest of the year? Will these attendees tell their coworkers about all the companies they've visited? After the trade show, will the attendees need to find a supplier from the trade show and will they have kept their freebies on hand, at their desk or hangar? I've heard many people who tell people at booths that they don't want to take their literature (flyers, posters, business cards, etc.) because they don't have enough room to take it home on the plane. Helicopter Trade Show Attendance Numbers: What about the low attendance numbers of helicopter trade shows? Yet the helicopter industry is a multi-billion dollar industry! 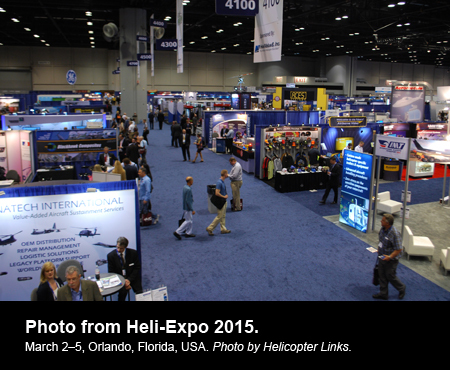 Take Heli-Expo in the USA, for example, which some say is the most important helicopter trade show in the world. For the last ten years, from 2008 to 2018, the attendance numbers for Heli-Expo have been reported to have been as low as 14,0001 to just over 20,0002 in attendance for a show. Helitech International had 4,9963 attendees per Audit Bureau of Circulation, in 2017. China Helicopter Exposition in 2017 had 50,000 total attendees per their website. HeliRussia had over 12,000 attendees in 2017, per their website. Heli Uk Expo in 2018 had 3,021 visitors, per their company. We can't find Helicopter Association of Canada trade show attendance numbers. So, where is everyone? To make a few comparisons and some might say this is not a fair comparison but... did you know that Comic-Con International brings in 130,000 plus in attendance each year in San Diego, California, USA?4 I'm actually only mentioning Comic-Con International to show that trade shows can be vibrant and packed. 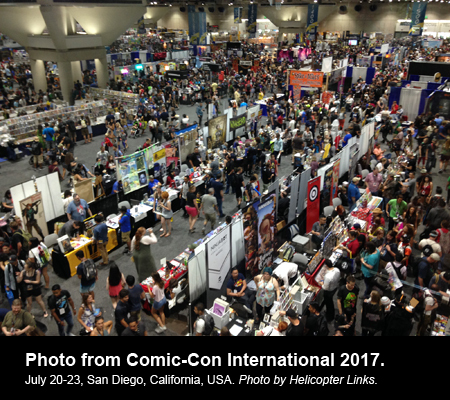 Comic-Con International has such big attendance numbers that it sells out every year and many people can't attend because the San Diego Convention Center is filled to capacity. Why Aren't More People Attending Helicopter Trade Shows? I've talk to some people from the USA and around the world about why they don't attend Heli-Expo. Some of my clients have told me they aren't interested anymore, some say it's too expensive and some don't have the time. About 3 years ago at Heli-Expo, I met the owner of a helicopter operator company from India. I asked him if any of his employees or pilots were attending. He told me he could not pay for any of his employees to travel to the USA and also that none of his employees could afford to travel to the USA to attend Heli-Expo. So, there's lots of people in the world who can't or won't attend helicopter trade shows for many reasons, yet many of these people are buyers in the helicopter industry and need to purchase parts, services and helicopters - both civilian and military. How Many People Work In The Helicopter Industry? I performed a Google search to try to find out the number of people who work in the helicopter industry worldwide, with no results. A professional who I know in the industry made a guess that 1 million people might be working, worldwide, in the helicopter industry. But who knows? Is it more or less? It seems to me that many companies are so laser focused on helicopter trade shows, they forget there are online advertising options, like Helicopter Links, to help brand, advertise and market their company on a year-round basis to buyers in the helicopter industry around the world. How Can Helicopter Links Help Both Small And Large Companies To Advertise Their Business? Helicopter Link can help most businesses advertise their business online and year-round. If being in front of buyers in the helicopter industry at helicopter trade shows is critical for small and big companies, then wouldn't it be in your company's best interest by being visible, 24 hours a day and year-round, to the buyers searching for sellers and end up visiting Helicopter Links website? Don't all companies want to be available year-round to attract new customers when the customer has a buying need? Helicopter Links website is just like a helicopter trade show, except it's online and affordable. How Do People Find Helicopter Links And Why Is This Important? Our website is search engine optimized (SEO) to help people in the helicopter industry find Helicopter Links site. We know Helicopter Links is SEO'd correctly because 80% of our visitors have typed two or more helicopter industry related terms in a search engine and then find, and use Helicopter Links website. This is important because your company can advertise to people who want to look at your advertising because they are seeking sellers in the helicopter industry. What Is The Purpose For People Visiting Helicopter Links? Our visitors are buyers in the helicopter industry, in the buying process, and are either ready to buy or researching before buying. Our visitors are seeking companies on a local, regional, national or international nature. It all depends upon their buying needs. One of the unique features about our website, is that Helicopter Links visitors are from both inside and outside the helicopter industry. Other people visiting from inside the helicopter industry are those searching for helicopter trade shows, helicopter magazines, helicopter associations, helicopter museums and more. If you are small, medium or large company, or a large corporation, how do you show online buyers from the helicopter industry on a year-round worldwide basis, that your company wants to earn their business? 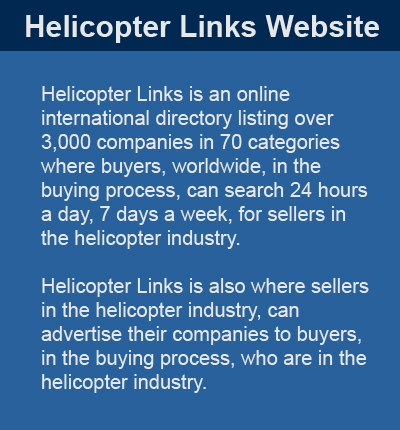 By advertising to buyers, ready to buy, on Helicopter Links website. I hope this article provides you a little bit of information how Helicopter Links is in the business to help market your company for the long term and on a local, regional, national and worldwide basis. Please feel free to call me, Mike Hampson, to discuss your advertising needs. Our direct phone is +1 (858) 413-7074 (San Diego, California, USA) or email us at staff@helicopterlinks.com. All photos by Helicopter Links. Please note: This article is about the importance of online, year-long advertising, which Helicopter Links website provides to its customers. I don't want to give anyone the wrong idea about helicopter trade shows. I personally love to attend helicopter trade shows, they are important to our industry and I enjoy every minute while I'm at a helicopter trade show. 5 - Farnborough Airshow attendance numbers for 2018.